Singer 348 Sewing Machine light. Needs cleaning. Singer 348 Sewing Machine face plate. Note: MISSING SCREW. Has stains, chips in paint and discolored from age. Needs a good cleaning. Good part for restoration. Color: Robins egg blue. Singer 348 Sewing Machine presser foot lifter. needs a minor cleaning. Singer 348 Sewing Machine screw that secures the thread tension assembly to machine. Will ship First Class & refund the difference. Singer 348 Sewing Machine slide plate. Needs a good cleaning. Good part for restoration. Will ship First Class & refund the difference. Singer 348 Sewing Machine thread guide GOES ON NEEDLE CLAMP. Needs cleaning. Will ship First Class & refund the difference. Singer 348 Sewing Machine throat plate clamp. Will ship First Class & refund the difference. Singer Simanco low shank rolled hemmer foot 120855. Needs cleaning. Will ship First Class & refund the difference. Singer 348 Sewing Machine balance wheel. Has stains, chips in paint and discolored from age. Needs a good cleaning. Good part for restoration. Color: Robins egg blue. Singer 348 Sewing Machine bobbin winder thread guide. Needs cleaning. Singer 348 Sewing Machine door for top cover to access fashion disk. Singer 348 Sewing Machine motor cover. Has stains, chips in paint and discolored from age. Needs a good cleaning. Good part for restoration. Color: Robins egg blue. Singer 348 Sewing Machine needle position lever. Shows wear. Singer 348 Sewing Machine presser foot thumb screw. Needs a good cleaning. Good part for restoration. Will ship First Class & refund the difference. Singer 348 Sewing Machine reverse lever. Not complete. 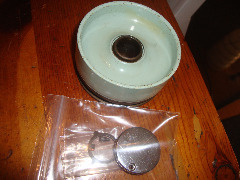 Singer 348 Sewing Machine slide plate spring. Needs cleaning. Will ship First Class & refund the difference. Singer 348 Sewing Machine Terminal Screw. Holds the plug receptacle in place. Singer Adjustable low shank zipper foot part #161127. Needs cleaning. Will ship First Class & refund the difference.